Ask the Author to help you understand His intent. Study God's Word with care ... accurately with sound hermeneutics and respect. Prepare the lesson with the goal of changed lives. Build a structure into your lesson that moves students from head knowledge to seeing the implications of truth for their lives and gives them opportunity to practice that truth so they are more likely to apply it in real life and bear fruit and get to know God better. Develop aims for the lesson as you look at Scripture with a view toward its application to life. 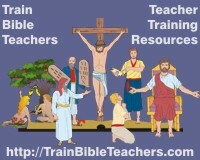 Ask what your students need to do differently as a result of the Bible truths. Pull out the principles from your study of Scripture that fit the age level you are teaching. Structure types and lengths of methods to communicate truth accordingly and use vocabulary appropriate to that age. Tap into the needs and interests of your students, showing the relevance of the lesson's truths to their lives. The application of the lesson should reinforce how they can put God's Word into practice. The introduction of the lesson should get their attention and help them from the start to see why this lesson is important for their lives. The introduction should be written after you have studied and developed the main content part of the lesson and the application. You need to first understand the truth and where the lesson is going to design an appropriate introduction. Incorporate a variety of methods and visuals to increase the potential for addressing the various learning styles in your class, to build interest and keep their attention. Make sure the methods you use grow out of the content rather than building your lesson around your methodology.